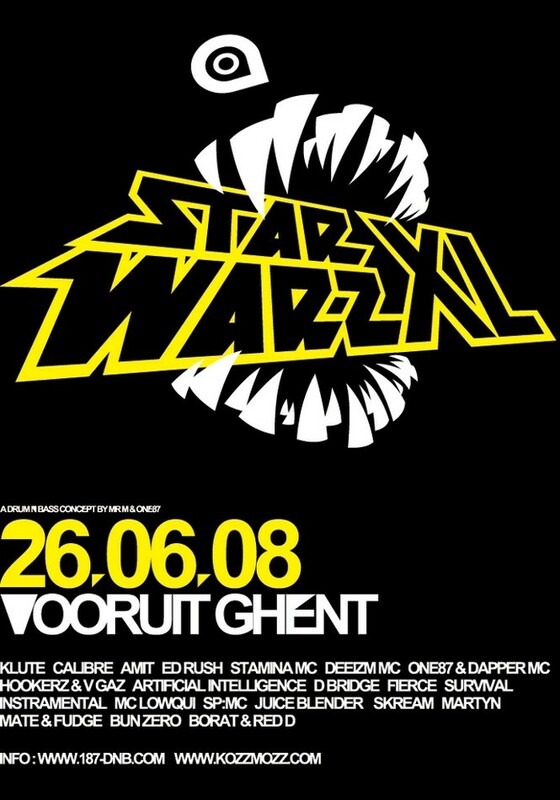 Six years since its launch and more than 20 editions later Star Warz continues to deliver the goods and holds up its status as leading drum ’n’ bass event in Belgium, if not Europe. The formula? There is no formula! The strength and appeal of Star Warz is build strictly on musical vision – uniting top notch names from the international arena (Goldie, Doc Scott, Andy C, Storm, Marcus Intalex, Randall - to name but a few) with exciting underground talent (Commix, D Bridge, Break, Klute…), labels (Exit, Soul:R, 31Records,… ) and the local elite (Juice Blender, Murdock, One87 & Dapper Mc…). A no boundaries, open policy – both musically and personally. The Vooruit venue continues to be its home base, a key factor in creating that unparalleled vibe that brings out the best in the performers and crowd. Star Warz takes proud in its reputation and persists in bringing its supporters the best, the boldest and brightest in drum ’n’ bass. May the force be with you! First up is Klute and his Commercial Suicide posse. He has been a fixture on the Drum ’n’ Bass scene for over a decade, lending his creativity to the likes of Metalheadz, 31 Records and his early stable Certificate 18, responsible for releasing his first two albums, Casual Bodies and Fear of People. In 2001 his own Commercial Suicide imprint was born and so far the label has seen releases by Klute himself, Calibre, Amit, AI, Tactile, Total Science, Digital, and Austrian prodigy D.Kay. On this party he’s bringing Amit who’s also made tracks for Metalheadz and Calibre, who’s going strong with his own imprint, Signature Recordings. After last years album ‘Second Sun’, a new Calibre album is unleashed upon us with the name ‘Overflow’ as well as a retro-spective compilation ‘Shelflife’. They will all be joined by Ed Rush who’ll teleport the concert venue back to the timeslot 1997-1999 with a specially commissioned old school set as well as One87 who brings MC Dapper along and young talents Hookerz & V Gaz. In the Ball Room two different labels battle it out: Exit versus Integral, that means D Bridge (Exit) versus Artificial Intelligence (Integral) – Fierce, Instramental and Survival join the ruckus. 21-year old Londoner Skream is one of dubstep’s most prolific artists – he’ll show of his skills in the Foyer, together with Martyn, Mate & Fudge and Bun Zero. No boundaries in the Café, where DJ Borat & Red D take you on a custom made musical journey. Set all phasers on stun, Star Warz XL strikes back in full force!